As a marketer, you look for every opportunity to get in front of the right people at the right time. This means adapting to how customers consume content. We are now seeing more marketers experimenting with AI and machine learning and incorporating them into their content strategies. In fact, several experts predict 2018 will be a big year for tech-enhanced experiences. One area we’ve seen explosive growth in popularity is the use of chatbots. 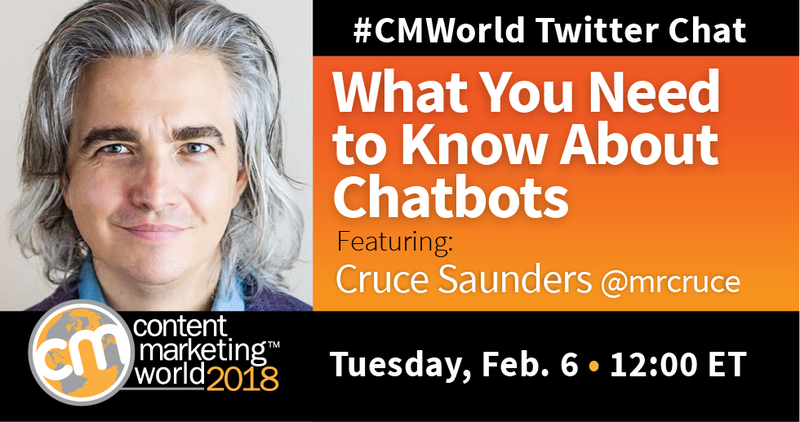 To explore the many questions we had on chatbots, we asked Cruce Saunders, Founder of [A], to join us for a recent #CMWorld Twitter chat. What follows are highlights from our discussion with Cruce. How can brands use chatbots to help provide a better experience for their customers? A1: It’s an opportunity to automate some of your most commonly asked questions, which means it can help free up your time. How can you best engineer your content for chatbots? We gained such great insights from both Cruce and our community! Want to see more tweets from this chat? Check out our Twitter Moment. Looking to strengthen your content strategy in this rapidly changing content landscape? Join Cruce in Las Vegas and attend Intelligent Content Conference, March 20-22. Code SM100 saves you $100 at checkout.